Cellulase is the enzyme that breaks down fiber. It is also the only digestive enzyme our body does not make. Fungi (Candida) is a group of organisms formerly regarded as plants lacking chlorophyll. They can either exist as single cells or make up a multi-cellular body called a mycelium, which consists of filaments known as hyphae. The cell wall of yeast and fungi contains some fungal cellulose or a compound called chitin. Chitin is a polysaccharide, or carbohydrate, which is structurally very similar to cellulose. Supplemental cellulase may help break down this “cellulose-like” chitin, aiding the body’s natural systems of purification and detoxification. Additionally, in individuals with Candida imbalance there is often a large amount of undigested fiber in the large intestine . It is believed that the mucus that the body naturally produces as a result of this impaired fiber (cellulose) digestion may protect the Candida from our body's immune system. By adding cellulase to the diet we provide support for fiber digestion, allowing it to be removed along with inappropriate mucus, allowing our body to achieve balance. The inside of the cell of yeast is mostly protein. Proteases are proteolytic, meaning they have the ability to hydrolyze (digest) protein. Protease enzymes have a long history of beneficial use for detoxification and purification. The addition of protease to this formula helps the body deal with excess "die-off" or common symptoms of cleansing. Take 2 capsules, 3 times per day at least 1 hour before or 2 hours after a meal for 7 days (for maintenance 2 a day). For acute issues, continue regimen for a total of 14 days. In extreme cases more time may be given. For best results 1 ViraStop may be added each time Candidase is taken. Candida albicans is a yeast-like fungus that normally lives in healthy balance in the body. It is found mostly in the intestines, genital tract, mouth, and throat. When the balance is upset, overgrowth results,allowing the fungus to travel to all parts of the body through the bloodstream. Yeast overgrowth affects both women and men. Symptoms of yeast overgrowth may include: Dietary sensitivities to food, low energy, poor digestion, (occasional heartburn, irregularity), sugar cravings, moodiness, irritability, headaches, difficulty concentrating, “fogged in” feeling, dizziness, urinary tract issues, sinus and respiratory congestion, skin rashes, cold extremities, or body aches. 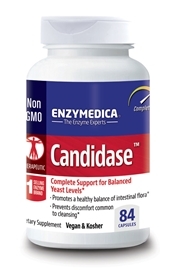 Candidase provides a powerful 1-2 punch to manage candida overgrowth while avoiding uncomfortable die-off. Prevents discomfort common to cleansing. Recommended Use: For moderate symptoms: 2 capsules on an empty stomach, one hour before or two hours after a meal three times daily for 7 days. For acute symptoms: 2 capsules on an empty stomach, one hour before or two hours after a meal three times daily for 14 days. For more advanced support, Enzymedica’s Candidase™ Extra Strength may be helpful. For maintenance: 2 capsules daily. For best results, 1 capsule of Enzymedica’s Enzyme Defense™ may be added each time Candidase is taken. Contraindications: Candidase should not be taken with any timed-release medication that uses cellulose as its time-release mechanism.